The Akebono Cherry (also called the Daybreak Yoshino Cherry) is a beautiful flowering cherry tree with species origin native to Japan. Having very soft pink bloom, supposedly double white flower that blooms in April, it forms a rounded spreading 25 foot wide by 25 foot high tree at maturity. As a cultivar of the Yoshino Cherry, it was selected and named at the W. B. Clark Nursery in San Jose, California around 1920. Akebono Cherry trees are deciduous and turn a yellowish color during fall making them splendid landscape trees for residential and commercial properties. 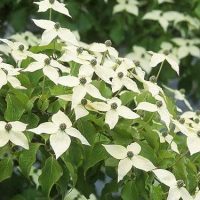 They have bright green, glossy foliage during spring and summer months. With a typical lifespan of 15 to 20 years, Akebono Cherry trees have relatively few insect or disease problems and make excellent specimen trees. More planting instruction can also be found at boydnursery.net/planting/. Size: 15 to 25 feet in height at maturity with 15 to 40 feet in spread. Habit: Rounded and upright spreading with medium adult size. 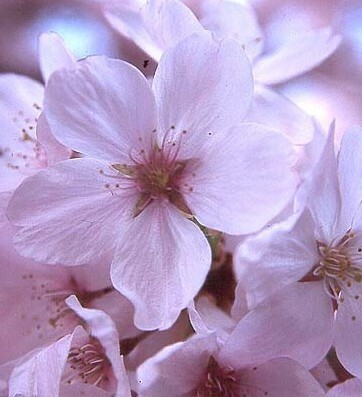 Flowers: The flowers emerge before the leaves in early spring; they are slightly fragrant, 1 to 1 and a half inches in diameter, with five pale pink petals. The flowers grow in clusters of five or six together. 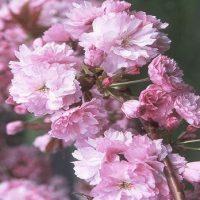 Landscape Value: With its flowers forming well before the leaves, Akebono Cherry trees are some of the showiest of all ornamental trees. As an excellent specimen plant, Akebono Cherry trees are often used in groupings to increase their appeal. 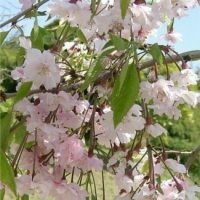 Because the Akebono Cherry develops into a much small tree than the Yoshino Cherry, it can be used for a wider range of landscaping purposes. Take care to give it plenty of sunshine when selecting a position for planting. Also, be mindful of eventual replacement. Akebono Cherry trees typically live for 15 to 20 years.